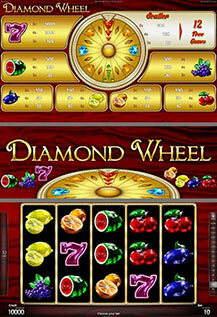 The new exciting game in brand new high resolution graphics offers a special Diamond Feature Wheel with the chance to win the Ruby Bonus. 3 or more Scatters trigger 12 feature games. Feature games can be won again during the feature and are played at current bet. Get the RUBY BONUS CHANCE in feature game and win up to 1000 times per bet.